Charlotte Fox was recently selected to receive the Lifetime Achievement Award at the 2017 Governor’s Awards for the Arts & Humanities celebration. Charlotte has, through her promotion of all the Arts in Alaska, always focused on Arts Education as a root to excellence in education and cultural enrichment for our future. 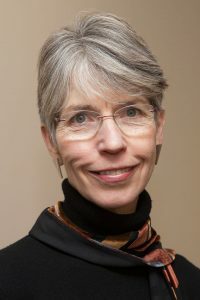 She was the Executive Director of the Alaska State Council on the Arts when–in 2002–she brought various arts education proponents together to address the long-term problem of arts education for teachers and students in Alaska. As a result, the Alaska Arts Education Consortium was formed and–14 years later–we are still actively working to educate teachers, administrators, parents, legislators and everyone else we can on the utmost importance of a well-rounded education with arts education as a core component. Charlotte Fox poses for a photo in the Administration Building on the University of Alaska Anchorage campus in Anchorage, Alaska Monday, Nov. 7, 2016. Charlotte Fox came to Alaska in 1970 for a summer job at a construction camp outside of Juneau. Like many Alaskans, she never left, except to receive a degree in journalism from the University of Oregon and marry her hometown sweetheart, Mike Stinebaugh. After a stint in Fairbanks where Charlotte worked for the University and Mike studied mechanical engineering, they moved to Anchorage in 1981. Charlotte grew up in an artistic home, but didn’t consider a career in arts administration until she was offered the job of the Executive Director of Alaska Junior Theater in 1988, which she held for 10 years. It was the first year of operation of the Alaska Center for the Performing Arts and AJT was a resident company. As a one person office, Charlotte was responsible for everything from bookkeeping to managing the huge cadre of volunteers. In 2001, she was offered the E.D. position of the Alaska State Council on the Arts. For the next 11 years, Charlotte advocated for arts and culture in Alaska, the western region and nationally. Under her leadership, the Council grew from a grant-making body to an organization heavily involved in statewide arts and culture policy. Charlotte cofounded the Alaska Arts Education Consortium, which provides intensive arts education summer institutes for hundreds of teachers. She also forged a valuable partnership with the Rasmuson Foundation, helping expand the Artist in Schools program and offer new arts education programs outside the classroom. She also created a funding mechanism to support the Alaska Contemporary Art Bank, which had not made any significant purchases since the 1980s. This program now makes annual purchases from Alaska artists with art that graces Alaska’s state offices. A statewide traveling exhibit of select pieces from the Art Bank was launched, bringing more awareness about the Council’s work in communities from Unalaska to Petersburg. Since her retirement in 2012, Fox has continued working as a volunteer and consultant, serving on boards and continuing to advocate for causes she believes in. She and Mike live in Anchorage, where they raised their sons, Kirk and Taylor.